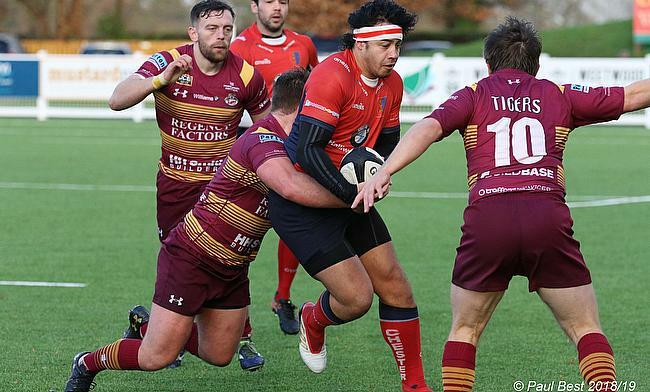 The second-placed side are 11 points clear of their nearest rivals, but Chester are also level at the summit with table toppers Hull Ionians. The league leaders are edging closer to a top two finish and Martyn Wood’s men travel to Macclesfield on Saturday. Speaking of Macc, they can be relegated this weekend if they fail to beat Hull Ionians and South Leicester could also fall through the trapdoor if they are unable to secure a bonus-point victory away at seventh-placed Otley. Elsewhere in National Two North, it is third against fourth when Huddersfield clash with Fylde, Tynedale host Wharfedale and Preston Grasshoppers entertain Stourbridge. Also, Hinckley travel to local rivals Leicester Lions and Sheffield Tigers take on Peterborough Lions. Hull Ionians negotiated another difficult hurdle in their quest to earn promotion from National Two North as they defeated Preston Grasshoppers in Round 27. After coming from behind to beat Otley two weeks ago, Martyn Wood’s side showcased a steely determination towards the end of March and the I’s remain on course for an immediate return to National One. The league leaders are level points with second-placed Chester, but the duo are 11 points clear of their fellow top two candidates as both Huddersfield and Fylde lost last time out. Destiny is very much in Hull’s hands and they can also stay in control of the title race when they visit Macclesfield. The hosts on Saturday are fighting for contrasting goals as the Blues currently sit 14 points from safety with three games to go. Andy Appleyard’s side know their fate will be sealed if the Blues fail to win in Round 28, but even if they are able to miraculously avoid the drop this weekend, relegation does seem to be inevitable for Macc. Chester’s win over Huddersfield last week was described by head coach Jan van Deventer as ‘mind-blowing.’ His side completely outclassed their Yorkshire opponents as the men from Hare Lane took a significant step towards a top two finish following their 57-10 win. Two crucial victories over Huddersfield and rivals Fylde have put Chester in a wonderful position not only to challenge for promotion, but also battle for the league title. The second-placed side now face another stern test this weekend when they travel to Sedgley Park. Two months ago, Chester may have been seen as heavy favourites but Sedge are having a roaring end to the campaign. A solid win over South Leicester in Round 27 for Matt Bebbington’s side means they welcome Chester to Park Lane having won their last six games of the campaign and they will be in no mood to let their momentum drift. The Tigers now sit just a point behind third placed Fylde so a victory over Chester could see them sneak into the top three of the division. Three weeks ago, this fixture between Huddersfield and Fylde looked as though it could define who would finish in the top two this season. Both sides were firmly in the promotion conversation but as we kick-off April, their hopes have almost extinguished. Field’s humbling defeat last time out against Chester means they are now 11 points behind second place and an awful lot would have to go in their favour if Gareth Lewis’ side were to defy the odds and finish in the promotion spots this term. With Chester going to an in-form Sedgley Park this weekend, that could provide a bit of optimism for Field and Fylde may well be thinking the same. Successive defeats for Warren Spragg’s side have derailed their promotion hopes and the Lancashire club seem set for another season in National Two North. A defeat for either side could mathematically rule them out of finishing in the top two, but victory at Lockwood Park could keep their slim ambitions alive. Another home victory for Tynedale and another trio of tries for Morgan Passman. The winger was at his brilliant best last week as Ben Woods’ side defeated Sheffield Tigers at Corbridge and due to Otley’s recent points deduction, the North-East outfit are now sixth in the table. Just three defeats from their last 12 games has seen Tyne transform their campaign and they will be eager to end this term in a positive fashion. Next up for Tynedale is a clash with Wharfedale and the Greens will be in high spirits when they travel up the A1. Rob Baldwin and Jon Feeley’s side produced an excellent display to narrowly beat Fylde last weekend so Dale head into this Saturday on the back of consecutive victories. The 10th placed side have had a very pleasing season after battling relegation over the last few years so the Yorkshire outfit will be keen to finish with a flurry, starting with a trip to Tynedale in Round 28. After such a strong National Two North campaign, the last week or so is one Otley would rather forget. The club were set to play a significant role in the race for a top two finish, but last week, they accepted a four-point deduction after fielding a 16-year-old player in a second team fixture. The Yorkshire club then suffered a hammering at the hands of Stourbridge so Otley will be keen to put the last couple of weeks of March behind them and begin April on the front foot. Of course, this has still been a very positive term for Otley who will likely finish in the top eight whereas for South Leicester, their time in National Two North is almost at an end. Seven straight defeats has left them on the edge of relegation and as they head into Round 28, they are 15 points from safety with three games to go. The Midlands club now must secure bonus-point wins from their remaining matches and hope Sheffield Tigers pick up zero points between now and the end of the season if they are to stay in this division, but in truth, their four-year stint at this level is over. All good things must come to an end and Preston Grasshoppers’ superb six match winning streak was halted by league leaders Hull Ionians in Round 27. Hoppers will have taken plus points from their defeat at Brantingham Park, but overall, it has been a very positive campaign for Paul Arnold’s side on their return to National Two North. As things stand, the Lancashire club occupy eighth spot and they can strengthen their claim for a top half finish when they host Stourbridge this weekend. Preston haven’t lost at Lightfoot Green since the end of January, but Stour will arrive in the North-West in a buoyant mood after thrashing Otley last Saturday. Neil Mitchell’s injury-hit side certainly delivered once again on home turf, but they will now be keen to see some success on the road. The Midlands club have won just one of their last 10 away matches and if they can harness their performance from last week, their baron spell on their travels could be improved this weekend. According to their club website, Hinckley’s new Director of Rugby Scott Hamilton was ‘relived’ after their narrow win over Macclesfield last weekend. In Hamilton’s first game in charge, the Hornets had to hold on for their 11th home victory of the campaign as the Midlands club continue to hunt down a top eight finish with three games remaining in the season. If Hinckley are to break into the top half, positive results from their final two away games of the campaign may be key, but they have found it tough on the road this term. The ninth placed side take the short journey to Leicester Lions having lost 10 of their last 11 matches on their travels while the hosts come into this game on the back of a hard-fought win. Andy Key’s side battled past already relegated Peterborough Lions in Round 27 and with local bragging rights up for grabs on Saturday, Leicester Lions will be keen to end the season in style. Well, Sheffield Tigers are nearly safe and I think it is fair to say they will have stumbled over the line. Jamie Broadley’s side have lost 10 of their last 12 games, but wins over Fylde, and more recently Leicester Lions, look as though they will be enough to keep the Tigers in this division for another season. In truth, the Yorkshire club will most definitely want to improve on their game management as that has plagued them at times this term but this weekend, a minimum of two points against already relegated Peterborough Lions will guarantee their status in National Two North. However, if the visitors’ performance against Leicester Lions is anything to go by, it won’t be a walkover for Sheffield Tigers in Round 28. Peterborough had their fate confirmed at the beginning of last month, but they will want to end their time at this level by showing some pride. A first away victory of the season still eludes them so there is every reason for the Lions to be ‘up for it’ on the weekend.